There is a saying that once you get a chihuahua you can’t have just one. I think it must be true as most people I know with chis have more than one chihuahua. What is it about this little saucy little dog that makes them so addictive? You start out with one and before you know it you have three or four. More chihuahuas must mean more fun, more chihuahua snuggles & kisses and more chihuahua love. It does, but their are other considerations to. Chis are quite small so having more than one chihuahua doesn’t pose the logistical problems that having several large dogs might. You can easily transport them if you are off to the park. Walking them on the lead, unless they are well trained, can be fun to watch. Performing the lead dance that resembles the French Knitting we did as children. They will play together so you are not totally responsible for their entertainment, having just one dog can mean they want your attention all day, it is also better for them if you are going to be out at work. If they are friends they will snuggle up together, lick ears and play. It is a pleasure to watch your chihuahuas make up silly games and chase each other around. Having more than one chihuahua is generally better for the dogs. But beware, chihuahuas don’t always get on with other breeds. They are known for their preference for a chihuahua based pack. That doesn’t mean they never get on with other dogs, there are plenty of examples of it working. But if you introduce a chihuahua into a mixed breed dog pack it could prove difficult. Especially if the other dogs are large. This could stress your chihuahua who may respond with fear biting behaviour. Chihuahuas like a pack hierarchy, they like to know who is in charge and if they perceive they can do the job better they will step up. This can cause conflict with an older more mature dog who might want a quieter life or disturb the natural order of your established pack. Once your chihuahua has decided he is in charge he could get bossy or aggressive over food and resources. Training more than one chihuahua can be harder than training one, as your focus is divided and you can’t always get multiple dogs to do what you want at the same time. This can be especially true of chihuahuas who can be stubborn. Getting your chihuahua pack to not bark at visitors or the postman would be essential! Toilet training chihuahuas can be a challenge, some chis can take up to 2 years to get reliable so if you have a multiple chihuahua household you are going to need a more relaxed view to accidents in the house and a good chi-wee cleaning system. 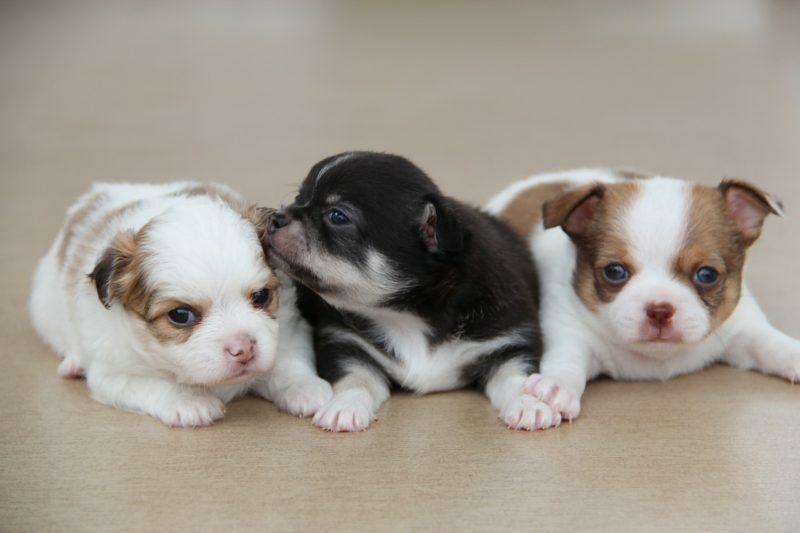 If you think you want more than one chihuahua, and who wouldn’t, don’t be tempted to get littermates. It might seem like a good idea when they are puppies, but as they mature it can cause conflict and fighting or they become so bonded to each other they take little notice of you. Littermate syndrome is a thing and most dog behaviour experts agrees that littermates are not a good idea. Dont be tempted to get littermates. However cute! Multiple dogs will also mean multiple vet bills, flea treatments, nail clipping and vaccinations. Having more than one dog can be very expensive. Chemical flea control can be as much as £9.00 per month per dog. Plus the cost of insurance which has gone through the roof, boarding if you want to go on holiday, passports if you are taking them with you. This is when using natural flea control, cooking your own dog food and learning to clip nails comes into its own. Do you have a multiple chihuahua household? We would love to know how they all get on. Previous Post Does Your Chihuahua Bark at the Postman? Next Post Is This the End Of The Solitary Dog Walk? I have 2 daisy and duke ..daisy 10 duke 5 she us the bug chi of the house duke loves daisy she loves him when she wants but will get in his face barking to correct him when he us bad and yes..she tattles on him if he has an accident. I love them with all my heart .